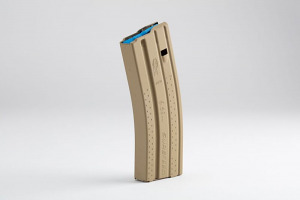 OKAY Industries Surefeed 30RD AR15 Magazine - Desert Tan PTFE - E2. This Okay Industries Surefeed magazine is designed for use with 5.56 mm/ .223 caliber ammunition and will fit/function in AR-15 style firearms that meet military specifications. These mags are top notch. I have run them through the harshest conditions and never a failure. P—Mags when filled with sand and debris I have seen fail. Ask any Marine about there new issued P-Mags. Surefeed has uncompromising quality from a reputable dealer. Great Service!!! My Mags arrived right away, and the pricing was great!! What can i say, it's OKAY! With that name comes 40+ years of USGI quality you can depend on. And ordering from Top Gun was fantastic! They supported those of us trapped behind enemy lines in commiefornia during Freedom Week's MAGApalooza. Thanks TGS!!! The Okay Industries Surefeed Magazines are among the best. The only magazine that doesn't require a slap or a forced push in when sliding it into your AR 15 magwell. My other more expensive mags I can occasionally have loading issues. The Okay Surefeed Mags are excellent and issue free. They easily slide in and snap and are very secure. I have fired over 1000 rounds and not one issue has occurred. Highly dependable, and their excellent construction should last a lifetime. Of all my Polymer Mags , I pick the Okay Mags over all brands that I have in my inventory. Dependable and built to last. Desert Tan S2 mag were as I expected. Liked the way the feel in my hand. Have not used them as of today.